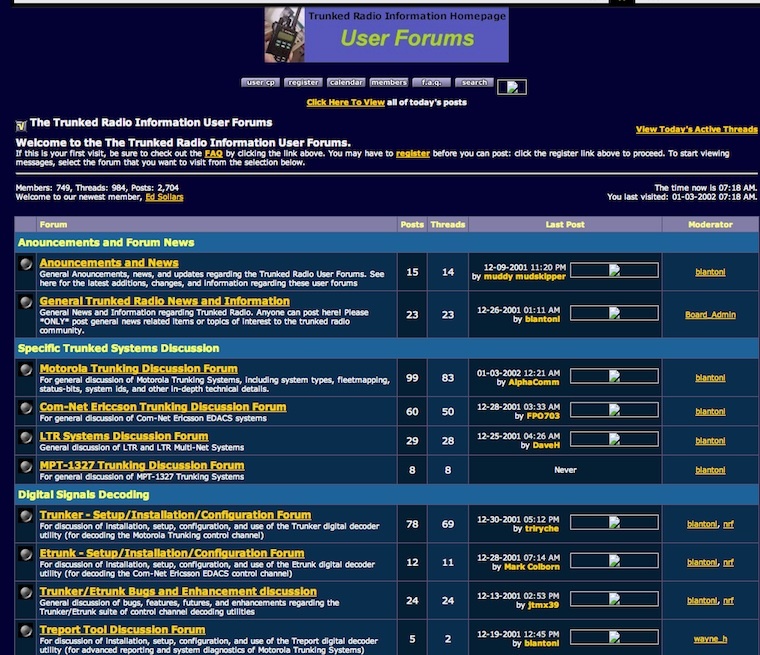 I'd like to take some time to do a walk-through of the history of RadioReference.com over the years, how we got to where we are, and what we looked like along the process. This will be a multiple post process over time. I've got a lot of content queued up and I'll post each of the progressions as I have time to. I'm doing this because it is fun to look back at where we were and how we have progressed throughout the past 15 years. To be clear: we would not be where we are today if not for the contributions from our admins, submitters, feed providers, customers, subscribers, donators, and everyone else who has helped to make this site what it is. Note: this thread is closed, if you would like to discuss the contents of this thread, head on over here.... otherwise read on! 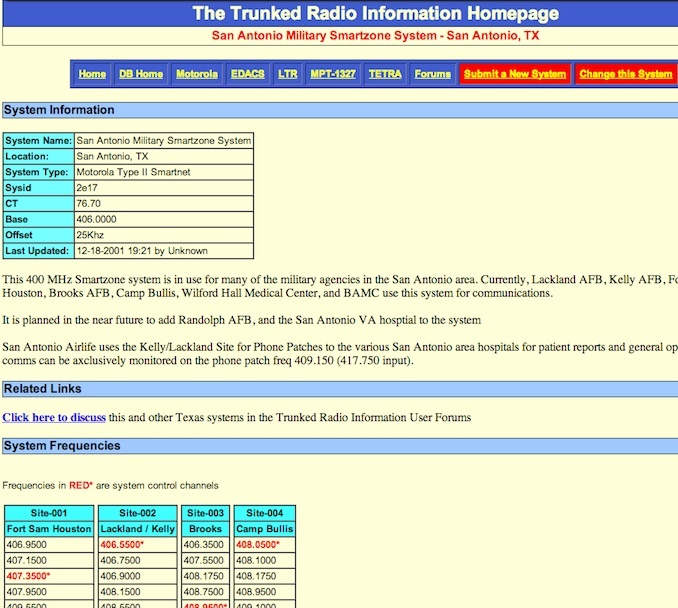 I was living in the Dallas/Fort Worth metroplex back in the late 90's, and when the first "Trunktracker" was released I attempted to develop a clearinghouse for talkgroups and other trunked system information, thinking it would help myself and others who needed to cross-reference the information. 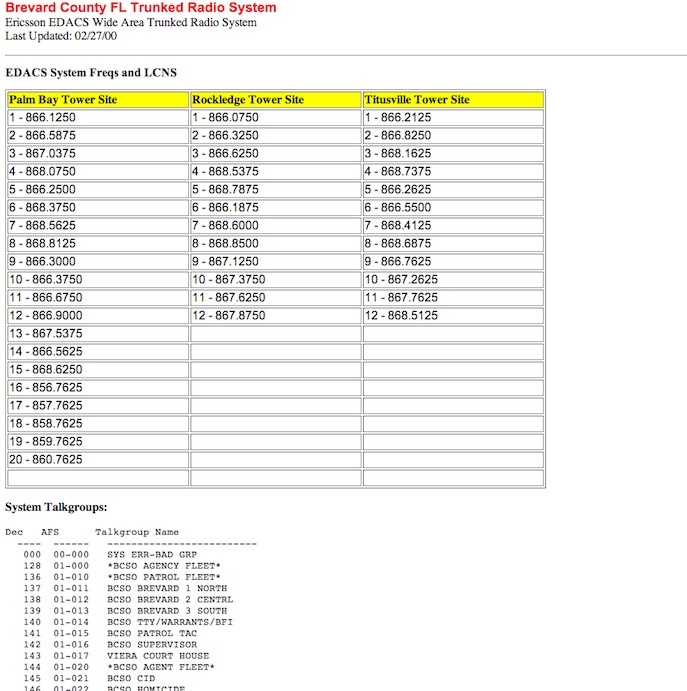 So I put together a page that gathered all these new "talkgroups" and "control channels." 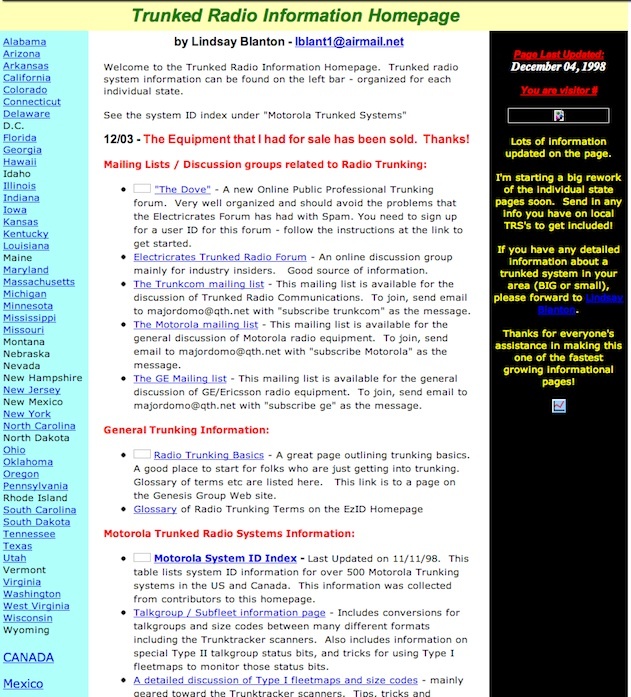 This is a screenshot from 12/04/1998 of http://web2.airmail.net/lblant1/trunked.htm (<- no longer exists), which was the initial page. This is the earliest archive of the page I can find. The page was developed and managed in Microsoft Frontpage (anyone remember that?!?!). 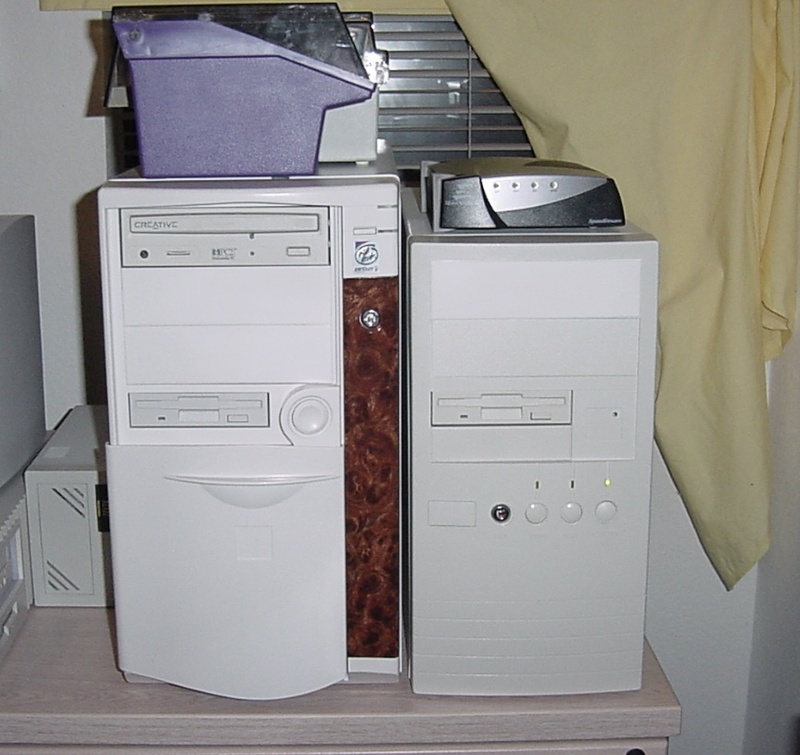 I first advertised the page on the rec.radio.scanner usenet forums and I immediately started to get emails of trunked system talkgroup and frequency lists. It was a little overwhelming, but I managed to dedicate time in the early mornings and evenings to manually create static html pages for each of the trunked systems that I received submissions for. That quickly became unmanageable. 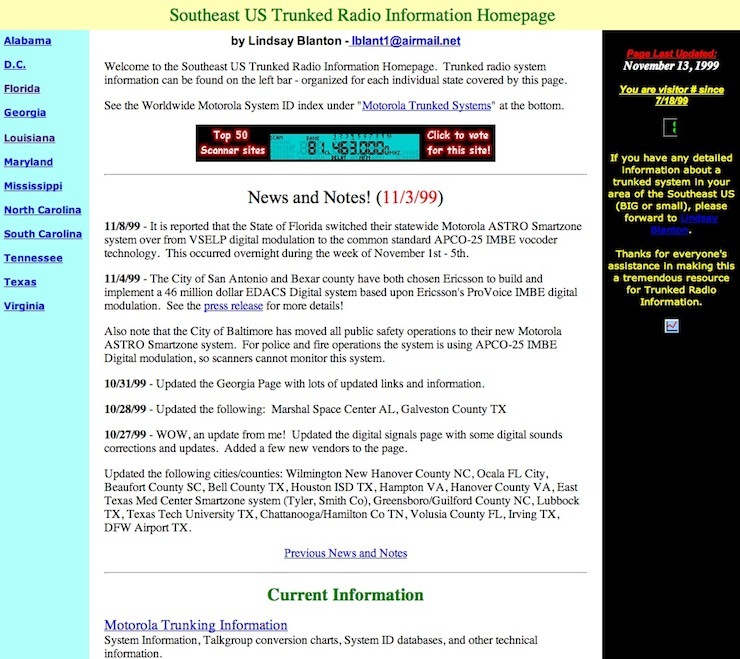 Coming up next up&#8230; our first domain registration . . . .
At this time, I was the only person managing the site and I was OVERWHELMED with submissions of trunked radio information. I made, at the time, a conscious decision to then focus on ONLY trunked radio information that related to the South East areas of the United States. We were still managing everything using Microsoft Frontpage and it's server extensions, which at the time was a pretty nice publishing system that allowed us to manage all the static pages and publish them to the Web with relative ease. Here is what an individual state page looked like. This is what a trunked system entry looked like back then. You've really got to love all the color choices that I made 12/13 years ago The sad thing is that it gets MUCH worse over the next few years. 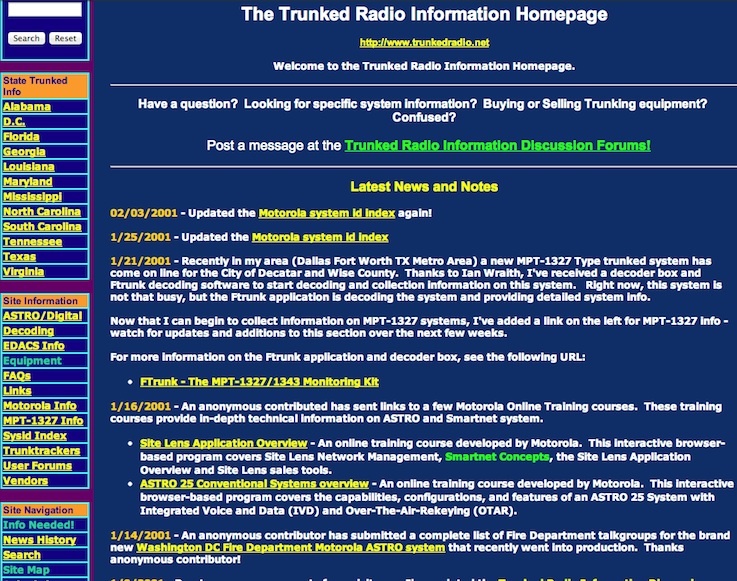 Next post... the birth of trunkedradio.net.... ! Let's have a look at the birth of trunkedradio.net. 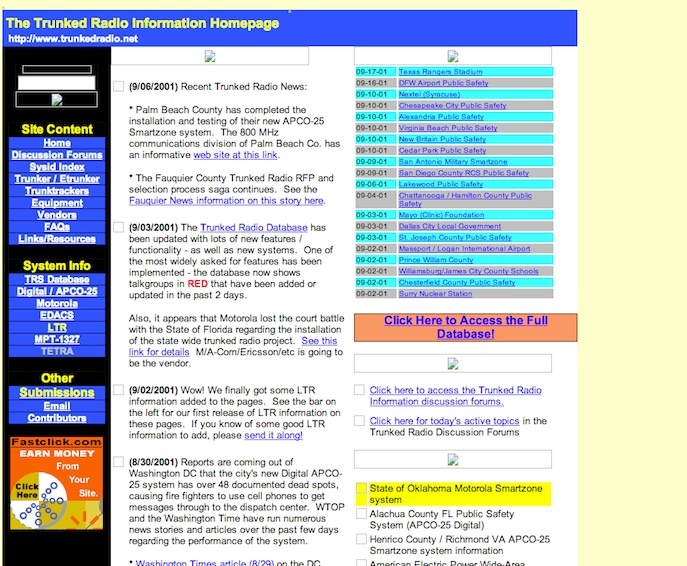 This is the first known screen capture of trunkedradio.net, back on February 6th, 2001 (incidentally my son would be born exactly 5 years later). 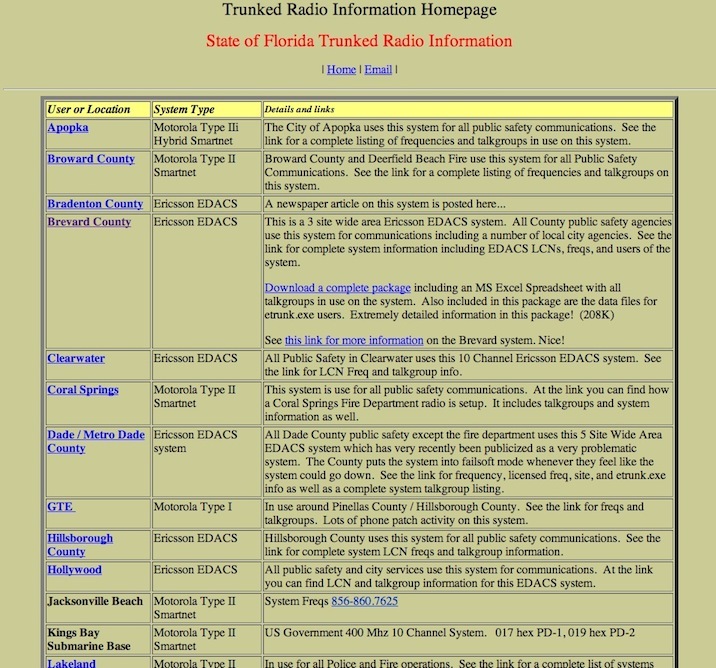 Not much changed at this point except we acquired the trunkedradio.net domain name and moved all the content over from lcblanton.com. All of this content was still statically managed using Microsoft Frontpage. However, by September of 2001, we managed to convert everything over to a dynamic site based on PERL and the MySQL database platform. It was the single step that allowed us to dynamically manage a database of trunked radio system information for the world. The site was custom written by me during my spare time between tending to a newlywed wife and working for IBM as a traveling SE. This really was the turning point, since instead of processing submissions via email and updating static pages, we now have a submission process where people could submit data and we could dynamically add pages to the site with ease. This is what a typical database entry looked like. Notice how we put RED emphasis on submissions and changes. Again, a first. ..and check out the forums. Surprisingly similar to today, other than it was focused solely on Trunked Radio discussions. Next up, our own Content Management System (CMS) and a move to the PHP programming language.